An in-depth exposition in which the author argues that the true and peaceful teachings of Islam must be drawn from the Qur’an and Muslim scriptures rather than the distorted interpretations of a small minority of fanatics . This lecture was delivered by Maulana Ataul Mujeeb Rashed, Imam of the London Mosque, at the University of Warsaw, Poland. Professor Solanta Sierakowska-Dyndo, Dean of Faculty of Oriental Studies, chaired the meeting. This important topic incorporates two different sentiments. One is the feeling of love and affection the Polish people have for their beloved country. Obviously no Polish citizen would ever like their country to encounter any threat to its peace and stability. Secondly, it has an element of fear in it that Islam and its increasing influence and impact in the world may be posing a threat to their cherished country. While I fully appreciate their feelings of patriotism, I would like to briefly comment on their apprehensions about Islam. There are two different perceptions of Islam. One is the true and real face of Islam, which I will discuss later. The other image is the one being projected nowadays through the media. Most probably the topic is related to this perception of Islam. If my assumption is right, then I would like to say that if you are afraid of an Islam which is responsible for terrorism and bloodshed of innocent people by explosions and suicide bombings; or promotes hatred and enmity between followers of various religions and wants to spread its message by force; or due to fanatical views and actions of some extremist elements who commit all these atrocities in the name of Islam; or that believes in enforcing Shari’ah laws upon non-Muslims living in Muslim countries; or denies basic human rights and treats women and non-Muslims horrifically, subjecting them to torture and disgrace; if these are your concerns and based on this perception of Islam you think that Islam does pose a threat to Poland, then you are truly justified. Not only you but I would say that all people of the world have the right to feel threatened by such an Islam. I myself would hate and run away from such a barbaric ‘Islam’. However, I want to assure you that this is a grossly distorted image of Islam that has absolutely nothing to do with the true and real Islam. Islam is simply opposed to all the vicious things mentioned above. It should be understood in no uncertain terms that the real Islam is that faith which is mentioned in the Holy Qur’an, the Muslim Scriptures, and which can be witnessed in the practical noble example and statements of the Holy Prophet of Islam(saw). Anything contrary and opposed to that is not Islam. Therefore you have to make a clear distinction between the real teachings of Islam and the self-styled views and practices of those who are abusing the name of Islam. It is indeed very sad that a large number of people have failed to recognise the beauty of Islam in this age. Islam is like a beautiful diamond of peace. From whichever angle it is viewed, it is absolute peace, pure peace and nothing but peace. What makes Islam a religion of peace? The very name of Islam is unique as for the first time in the entire history of religion, a religion has been given a name that literally means peace. It also has the meaning of total submission to the will and command of God. Unfortunately, Islam nowadays is being equated with a religion of terror and bloodshed, and a large number of people actually consider it a religion which promotes hatred between peoples and between nations. The fact is that Islam is the greatest proponent of peace and the Holy Prophet Muhammad(saw) was the greatest champion of peace for all times, promoting the message of peace for the whole of mankind. I would like to take up what the Holy Qur’an says about these issues. This will help you to understand that Islam is truly the message of Peace, far from being a message of hatred, terror, violence or bloodshed. It categorically declares that people of the whole world are totally free to choose their faith, whichever they like, to which they are happy to subscribe. There is nobody on earth who can in any way compel or force anybody to accept the religion of Islam. The Holy Qur’an declares that freedom of belief is the basic right of all human beings. They can believe in any religion they like and they can become the member of any faith they choose. Islam is a truth manifested. As for those people, who like to believe in it, let them do so and as for those who do not like to believe in it, let them deny it. There is no compulsion in matters of faith. People are given a free choice; Islam does not have any instrument of coercion or compulsion to convert any person into the fold of Islam. Had the punishment of apostasy had been death, then how can a person who renegades come back into the fold of Islam for the second time? The Holy Qur’an clearly states that a Muslim who leaves his religion for some reason, may come back to his faith, if he so desires. The choice and option to return is always available. There is neither any wordly punishment for apostasy nor is any element of compulsion permissible to force a person in any way to accept Islam and then to remain a Muslim throughout his life. According to Islam, religion is a matter of choice. If people are happy with the truth of Islam and are fully satisfied with its teachings then they are most welcome to join Islam; but if they decide not to accept Islam, then there is no compulsion on them. Even after joining Islam, they may leave it if they so choose. God Almighty will take this matter in His own hands in the hereafter, but nobody has the authority to dispense any punishment for apostasy in this present life. The next question very frequently asked is regarding the punishment of blasphemy in Islam. It is said and believed by many people, including unfortunately many Muslims, that the punishment for blasphemy is death. Such an assertion is totally incorrect. The Holy Qur’an mentions nowhere that the punishment for blasphemy is death, nor even a lesser punishment. As a matter of fact, there is no worldly punishment for this crime. No doubt, according to Islam blasphemy is a very despicable and offensive crime, but the punishment for it is entirely in the hand of God Almighty. He may punish the culprit here in this life, or in the hereafter. We believe that every person will be answerable to God. On the Day of Judgment, God Almighty will decide the fate of each person, but He has not authorised anybody in this life to give any punishment whatsoever in this regard. Another question that bothers the minds of many is regarding the Islamic teachings about dealings with the followers of other religions. Does Islam teach the Muslims to hate or to show respect and kindness towards them? It is worth noting that there is no mention of religion here. The Holy Qur’an says that you should always accept the invitation to join in performing a good deed for a noble cause, whether such an invitation is from a Jew, a Christian, a Hindu, a Buddhist or follower of any religion or even from an atheist; Islam requires Muslims to come forward and cooperate with such people. They should look only at the cause for which they are being invited; they should not look at who is inviting them. This makes it abundantly clear that Islam enjoins on its true followers to always behave justly even with enemies. Is there any possibility that such a religion promotes this beautiful teaching of harmony and cooperation, can ever promote violence or hatred against other people? Jihad is an Arabic word that means striving for a noble objective. In the Holy Qur’an when Allah calls upon people to engage in Jihad this refers to striving for a noble cause. According to Islam Jihad can be carried out in many ways – all of which seek to establish and promote peace in society. The greatest Jihad is to struggle against selfish temptations such as greed, lust and other worldly desires. It requires one to become more self-disciplined. It is incumbent upon all Muslims at all times. Preaching the message of Islam with wisdom, tolerance and respect for others and their beliefs and without recourse to any coercion or force is another form of Jihad. Helping those in need, irrespective of their colour, creed or race, is yet another form of Jihad that not only helps to alleviate the suffering of mankind but also establishes social peace and harmony between the rich and the poor. Another form of Jihad is to engage in self-defence. It can only take place in certain circumstances. The Muslims can take up arms in self-defence only if they have suffered oppression, faced a threat to their life and been driven out of their homes simply for practising their religion. When the Prophet of Islam(saw) was forced to migrate from Makkah to Madinah, the people of Makkah did not leave him and his followers in peace. Rather they attacked him time and again; and almost all the battles took place in the vicinity of Madinah. This clearly indicates as to who the aggressor was. Should the need for a defensive battle arise then Islam also provides Muslims with clear instructions regarding what can and cannot be done, e.g. civilians who are not actively fighting against Muslims are not to be attacked, property such as crops or other sources of food and water, hospitals, orphanages, places of worship (of all religions) are not to be destroyed and women, children, the old and the disabled are to be left untouched. Hence, it is very clear that the purpose of any such battle is to restore peace and not to promote aggression. Jihad in all its forms is, therefore, a means to promote peace both in ourselves and in our society. Any action that does not promote peace cannot be referred to as Jihad. Some people nowadays commit various acts of terrorism, unfortunately, in the name of Islam. Those are only a few who betray their own religion through their actions which are diametrically opposed to Islam. As such, they are the defaulters who are doing a great disservice to their own faith. Those who commit these atrocities and acts of terrorism against other people in the name of Islam should never be allowed to hijack the beautiful name of Islam nor be taken as ambassadors and representatives of Islam. They are the violators of their own religion and deserve to be strongly condemned and severely punished for the acts of aggression and tarnishing the beautiful image of Islam. I have presented here only a few examples of the teachings of Islam as mentioned in the Holy Qur’an. This establishes clearly that Islam has nowhere mentioned any teachings promoting terrorism or war against other people. It also establishes that only a peaceful person can be truly a Muslim and the people who commit atrocities, aggression and other barbaric acts like suicide bombings, even if committed in the name of Islam, do not deserve to be called Muslims. To say that a Muslim is a terrorist or to use the ill-conceived term of ‘Muslim Terrorist’ is certainly like putting light and darkness, fire and water or death and life together. They are completely opposite to one another. I assure you that a true Muslim can never be a terrorist and a terrorist can not be called a Muslim! Islam has got no room for terrorism and the whole concept of terrorism is totally alien to the teachings of Islam. Some of you might be wondering if there is any such Muslim community in the world today that really believes in and practises such Islam? There is such a Muslim community. Its name is the Ahmadiyya Muslim community. It is a Divinely inspired global community, dedicated to the revival of the true message of Islam as contained in the Holy Qur’an, a verbal revelation of God Almighty given to the Holy Founding Prophet of Islam, Prophet Muhammad(saw). The same message was practically demonstrated and verbally explained by the Holy Prophet of Islam(saw). In the latter days, God Almighty had destined to send a spiritual son of the Holy Founder of Islam(saw) in the person of the Imam Mahdi, the rightly-guided leader, and the Promised Messiah in Islam to revive the religion of Islam which embodies the true message of salvation for the whole of mankind. All this was fulfilled through the advent of Hadhrat Mirza Ghulam Ahmad(as) who was born in Qadian, India in 1835 and passed away in 1908. Under divine instruction and guidance, he laid the foundation of the Ahmadiyya Muslim Community on 23rd March 1889. This community is an embodiment of the benevolent message of Islam in its pristine purity that promotes peace and universal brotherhood. It is a purely religious community with no political objectives, thoroughly committed to the welfare and service to mankind in all parts of the globe. Its motto “Love for All, Hatred for None” beautifully epitomises the essence of Islam. The community is involved in building hundreds of schools and colleges, establishing clinics and hospitals – open to all and providing help to deserving students and patients. Its charity, “Humanity First”, recognised by the UNO, is always at the forefront of providing humanitarian assistance to suffering mankind irrespective of colour, creed, race or religion. The community is also tirelessly engaged in spreading and sharing the peaceful life-giving message of true Islam throughout the world. It has produced translations of the Holy Qur’an in more than 69 languages and other Islamic literature in 120 languages of the world. 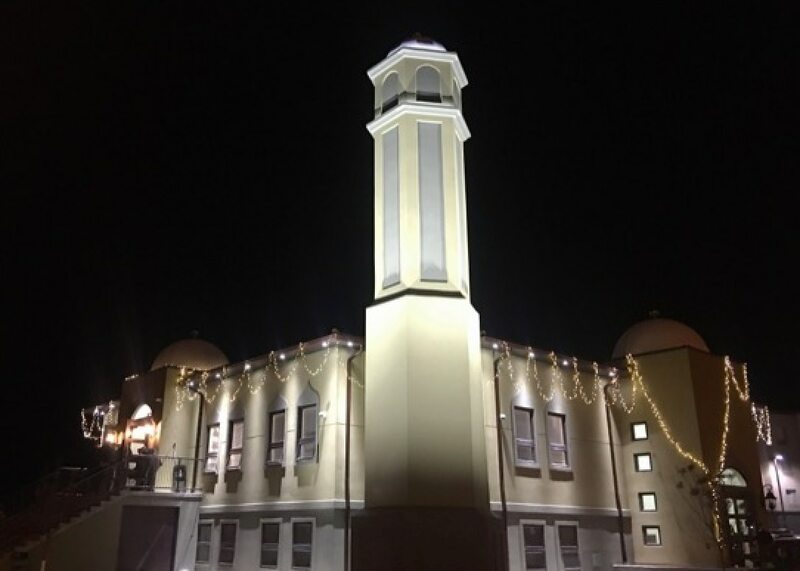 The community runs a 24 hour global (satellite) transmission network called MTA – Muslim Television Ahmadiyya International, which takes its message in world languages to the farthest ends of the earth. A powerful website called “Alislam.org” is visited by more than one million people every month. 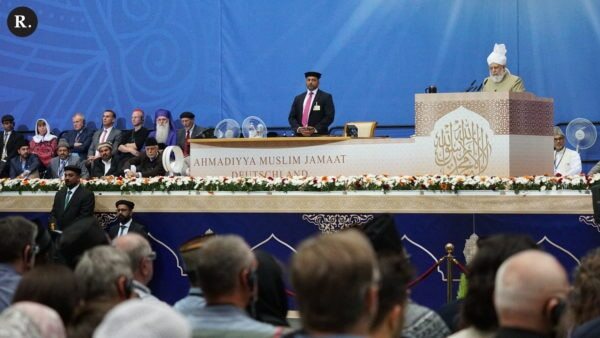 The Ahmadiyya Muslim Community, from its modest beginning some 121 years ago, has now grown to be acknowledged as the most dynamic denomination of Islam in modern history. It has active branches in more than 195 countries. The mission in Poland was re-established after World War II in 1990. An outstanding distinction of the community is the system of Khilafat: a spiritual system of leadership which is Divinely established, inspired and guided. The head of the system is known as Khalifa who is the spiritual, religious and administrative head of the global community. The current Khalifa, the supreme head of the community, Hadhrat Mirza Masroor Ahmad(aba) is the 5th successor to the founder of the community. This system of Khilafat, which is rooted in the teachings of the Holy Qur’an and based on the sayings of the Holy Prophet of Islam(saw), is the real motivating and unifying force behind all the achievements of the community. No other Muslim organisation shares this distinction. I have tried to explain the peaceful teachings of Islam and in which Muslim Community you can see the practical manifestation of these peace-giving teachings. Islam, the final message of guidance given to mankind and the definite recipe of salvation, is a message of love and peace and not a message of terror and warfare. Lay aside all the fears that you may have in your hearts, looking at the horrible experience of atrocities being committed by a bunch of terrorists and extremists. They are in no way the representatives of Islam. They are not the standard bearers of Islam. There can be nothing more wrong than to take them as the yardstick of understanding Islam. Traitors and defaulters can never be the ambassadors of their religion. Rest assured that true Islam is that which carries the stamp of authority from the Holy Qur’an, the absolute word of God; and is in conformity with the sayings and the noble example of the Holy Prophet(saw), the founder of Islam. This Islam is nothing but peace. All Polish people need not be afraid of the real and peaceful Islam. It is not at all any threat to the peace and stability of your great country. Do not be taken in by the misleading and horrifying doings of these extremists, the hidden enemies of Islam. Islam is a religion of hope and life for every one. My dear Polish friends! Come forward and study the Holy Qur’an, the real basis of Islam. You will find in it only love, peace, harmony and eternal salvation. May God bless you all abundantly and also your beloved country. 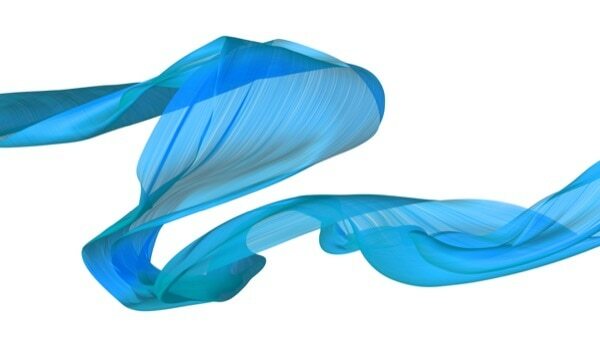 This is to express my gratitude to you for intellecually deep and scholarly impressive statement of what you stand for. Clearly, you represent peace loving ideology and theology which are also highly valued by the peace living people all over the world. My concern here, however, is with standing of other, non-Ahmadiyyan, forms of Islam regarding issues addressed by you in the lecture delivered by you recently at the University of Warsaw. For example, Sufizm which is a mystical branch of Islam seems to be divided on these matters of concern, as clearly represented by Sunnis and Shiites. I note that, as you did put it: “I would say that all people of the world have the right to feel threatened by such an Islam. I myself would hate and run away from such a barbaric ‘Islam’.” Unfortunately, there is historical evidence pointing to concerns that this “running away from barbaric Islam” is here with us to stay. Why? because, it has already begun running after those who consider it ‘barbaric’. Therefore, what truly is Islam? What are the theological and ideological differences between Muslims that have led to atrocities, as exposed by the mass media?